I am a girl named Olya. 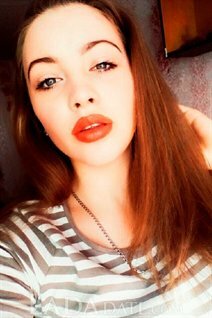 I love very much when my name is caressing Olechka) I am a very romantic person, I love to watch melodramas, to be sad and to dream of such love as that of films. I love to walk in the evening city or by the river. I like it when strong and intelligent men pay attention to me. I am faithful and strict, gentle and tender. My mood depends on the change of weather, but this is of course a joke. In fact, I am a friendly and cheerful girl. I love to joke and laugh, like all girls looking for my love. That most sincere and true love. And I really hope that I find it here! I really love life on this always spend time is fun. I go to volleyball, I like to play sports. I dance and often go out with friends, but if I were a man I would spend all my time with him. I like to read books and of course to dream. I travel a little and want to fly around the whole planet, of course with my man. I'm looking for a decent man who can understand and support me in difficult times. I want him to understand me perfectly. He must be strong and courageous so that he can protect me. I want to be his faithful girlfriend and of course wait for it in return. I want to know him and please in everything, because this is my man. I want to conquer it in all senses and be his faithful half. I hope there is such a "my" perfect man.